Classic comfort food. 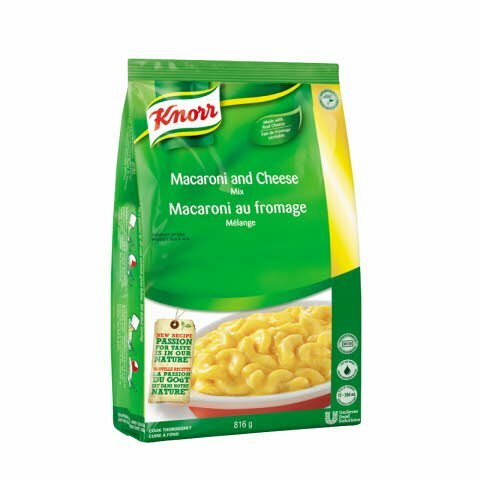 Premium quality macaroni and cheese with scratch-like appearance and flavour. DIRECTIONS NOTE: Product MUST reach a minimum of 82°C (180°F) measured with a thermometer for 2 minutes by all cook methods given below. Stir before serving.STEAMER: In a suitable container, gradually whisk contents in 2.5 litres (2.5 quarts) of boiling water. Cover container. Place in steamer and cook for 45 minutes. See NOTE above.STOVE TOP: In a suitable container, gradually whisk contents in 2.5 litres (2.5 quarts) of boiling water. Return to a boil. Cover and simmer for 20 minutes. Stir occasionally. See NOTE above.CONVECTION OVEN: In a suitable container, gradually whisk contents in 2.5 litres (2.5 quarts) of boiling water. Cover container. Set oven temperature to 176° C (350° F) and cook for 45 minutes. See NOTE above. Noodles and sauce cook simultaneously, and just add water, no costly dairy needed. Multiple preparation methods accommodate varied kitchen layouts and BOH space. Ready to serve in 30 minutes. No freezer or refrigerator storage required. Serve as the perfect accompaniment to your favourite dishes. Get creative, adding any combination of ingredients such as barbecue pulled pork topped with fried onions, etc.